With the looming holiday season retailers and e-tailers alike are either focused on putting the final touches on their marketing plans or have already launched their first campaigns. For those who are running behind, this is also the time when some tend to fall back on old habits - mass marketing. The hard learned lessons of the recent past should neither be forgotten nor abandoned. Now is indeed the time to leverage your data to hyper-personalize and run an omnichannel blitz. The traffic volume, both online and in brick and mortar stores, certainly do not make it easy but it is, nonetheless, the need of the hour. While it is certainly easy to criticize this behavior, look on the bright side. Sometimes the sense of urgency brings out some pretty amazing ideas. And there is always that sudden holiday trend that pops up seemingly out of nowhere. Here are some ways to capitalize on these situations, no matter what holiday it is. 1. Follow the Digital Footprint: Take stock of the data you have. 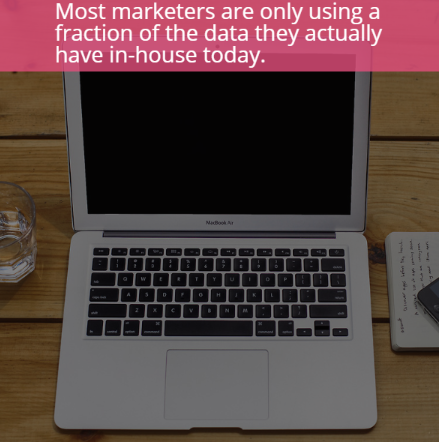 Most marketers are only using a fraction of the data they actually have in-house today. Look at Google analytics, social media listening reports, dive into your customer database, your marketing automation system, ask IT what else is available. Gems can be found in terms of behaviors, preferred channels of communication, actual time of day your best customers engage, etc. Roll up your sleeves and pour through what TYPES of sources and information you have. You’ll be surprised at what can jump out and inspire creative thinking. ii. Outsource to an analytics firm. They can typically get an expert on your account right away, and will have a deep pool of varied talent to draw from. Sometimes they might even have access to sophisticated systems, tools and architectures your internal team doesn’t have. A firm that specialized in marketing analytics is your best bet. They do this all day long with huge data sets, and small ones. iii. Cloud-based Tools: Packaged big data analytics options available in the market can also be considered. There are scalable products available focused on getting key info from your big data. Consider self-serve analytics tools like Tableau, Qlik, and ClearStory, some of which have trial or free public versions. If you haven’t maxed out Google Analytics, there are some pretty powerful capabilities to leverage there as well. 3. Make Love Not War: We’re talking system and people integration. Your sales team is an incredibly valuable resource. When asked, they may have some pretty amazing ideas for short-term outreach campaigns. They are your frontline after all. Bring in the troops. 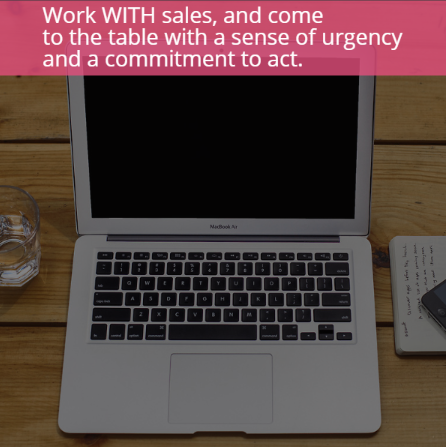 Work WITH sales, and come to the table with a sense of urgency and a commitment to act. You also probably have strong integration between your sales and marketing automation systems. Include these capabilities in your discussions to find some gems—be it microsegments, engagement behavior, a hot trend or product bundle to spotlight. 4. Plan for the Next Big Thing: You know the next hot trend is coming. It always does. Don’t wait for it, then say you couldn’t respond that quickly. Be ready to pounce. Social data holds the keys. Social listening can be a good heads-up for some block-and-tackle quick hits. Some examples… In fashion? ‘Listen’ for color trends and change out your artwork fast to feature those products. Online retailer? A trending product hit is an open door. Call a brainstorming session, throw some upsell and cross sell ideas on the table and get a new bundle tee’d up in just days. 5. Match inventory with sales. Big Data gives you an opportunity to forecast sales with a lot more accuracy. While there is typically a lot of focus on ensuring that retailers carry the right product, prices them at the right level and promotes them aggressively, less focus has been put on ensuring that the inventory is available in the right stores—particularly important during the holiday season when the popular items can fly off the shelves quickly. Use your data to its fullest extent to ensure that have enough of the right inventory available at the individual store level. Marketing is getting more efficient with big data. One no longer has to collect user preference data by asking them about it. Digital footprints tell us a lot about our customers without asking. New tools, technologies, cloud based platforms are turning marketers into the heroes of the big data movement. We can act faster, spend more efficiently, and most importantly focus on customers who want what we have to offer. Dr. Anil Kaul is the CEO and co-founder of Absolutdata. A prominent and well-known personality in the field of analytics and research, Anil has over 20 years of experience in marketing, strategic consulting, and quantitative modeling. Before starting Absolutdata in 2001, Anil worked at Personify and McKinsey & Company. He has a Ph.D. in quantitative marketing from Cornell University.